“Oh, god.” Steve seemed so far away. Steve was holding her hand again. His fingers felt swollen and hot where she had been crushing them a few minutes earlier. “Caro. I don’t want you to worry about the baby, okay? Dr. Malakar says he’ll be—” his voice cracked and he swallowed his next few words. The sound of Steve vomiting drifted into Caroline’s awareness, but before she could recognize the sound, sleep closed around her like a fist. “He just had to get some air. He’ll be back in a moment. Would you like to hold your baby?” The nurse gave Caroline a taut smile. Caroline nodded. She wanted water. She wanted painkillers. She wanted to eat—everything, everything she could think of that was edible, she wanted to eat it all. But this should come first. Caroline nodded again, held out her hands. The nurse did not give her the blue bundle. Where eyelashes should have been, there was a smooth expanse of skin, traced with impossibly fine blue veins. There was not so much as a crease to show where the lid should have perforated. Caroline stared at the silent baby on her chest. Other than his fused eyelids, he was perfect. His skin was very pink; she could feel his heartbeat under her hand. He sighed in his sleep. Caroline did not want to let her eyes close—did not ever want her eyes to close again—but as soon as the baby was out of her arms, she found herself falling asleep once more. In her dreams, the nursery window was ajar, and she fought to close it against the wind. Dr. Malakar’s hands trembled as he handed Caroline the tiny sample jar. She held it up to the light, peered inside, then looked sharply at Dr. Malakar sitting in the chair next to her bed. Steve stood in the doorway with his hands in his pockets, while two different nurses checked Caroline’s vital signs and replenished her saline drip. Nobody would look at her. Dr. Malakar’s usually clipped, precise voice was gentle. He spoke with incredible care, as always, but his gentleness brushed a feather of fear against Caroline’s cheek. “Well, ah, yes. Yes, he’s okay. He’s actually right over there.” Dr. Malakar pointed to the blue bundle, now sans hat, in a plastic hospital bassinet on the other side of Caroline’s bed. “It’s a very simple procedure, we didn’t even have to anaesthetize. Just a local. Very simple procedure, yes. Very simple. And he now has fully separated lids. But I’m afraid…I’m afraid that your baby—” he struggled to find the next words, failed, and was silent. Dr. Malakar was saying something about the rarity of this particular congenital defect, but Caroline was not listening to him. She was hypnotized by the things in the sample jar. Dr. Malakar was startled enough at her interjection to make an instant of eye contact with her. In the moment before he looked away, Caroline’s heart dropped. She had known Dr. Malakar for twelve years. They had worked closely together for most of that time. They had lost patients together, had delivered stillborn infants to unprepared mothers. He had slept on Steve and Caroline’s couch when his wife asked him for a divorce. In all of those years, she had never seen him as haunted, as broken, as he did in the split second before he tore his gaze from hers. A minute passed, and still, nobody had answered Caroline’s question. Several times, Dr. Malakar drew breath to answer her, then closed his mouth silently. He motioned for the nurses to leave the room. Steve turned toward the door, put his hand on the cool pane of glass as his throat worked around unsayable words. Caroline rested a hand on Dr. Malakar’s arm. Dr. Malakar took a slow, deep breath. “That’s what was in there.” He said it so quietly that Caroline was not immediately certain that it had been his voice, and not the fluttering of tiny wings against glass. She let her eyes drift up to Steve, who had pressed his fists into his forehead. A stuttering noise was coming from his direction, and it took Caroline a moment to realize that her husband was weeping. His jaw clenched, relaxed, clenched again. He met her eyes, and his expression was one of stark desperation. The glass of the sample jar creaked as Caroline tightened her grip. 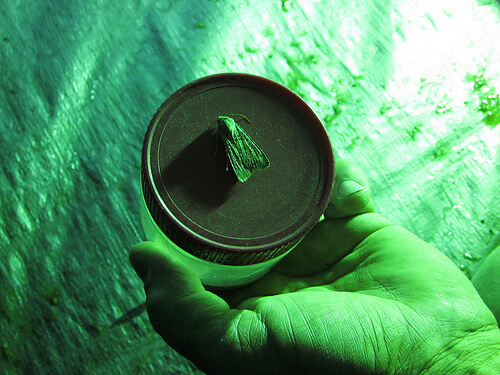 The four brown moths inside of it threw themselves against the sides of the jar, terrified. Their wings left streaks of shimmering brown on the underside of the plastic lid. Across the bed from Dr. Malakar, the plastic bassinet shifted as the baby began to wake. Sarah Gailey is a Bay Area native and an unabashed bibliophile, living and working in beautiful Oakland, California, with her wonderful husband and their terrible cat. She likes to paint, bake pies, and write about murder. Her favorite cigar is the house-rolled En Fuego Sweet Churchill. She makes period-accurate mid-Victorian costumes to fend off the ever-encroaching boredom. If she asks for Coke, Pepsi is not an acceptable substitute, but she’ll say yes to avoid making a fuss. Find her at @gaileyfrey. A dark and beautifully written piece of flash fiction. Wonderfully intense.